Nissan is clearly reaping the reward of a multistep strategy to position the Rogue to challenge the CR-V and RAV4. Nissan Division posted a June sales record, gaining 13 percent over last year, thanks to big demand for its Rogue compact crossover. The brand is now looking for more production volume for the model -- which is already coming from three factories. Nissan Division sales totaled 114,243 in June, up from 101,069 a year earlier. Rogue sales rose 54 percent for the month to 23,243. The Rogue closed in on its two market-leading rivals. Honda’s CR-V had 28,349 sales in June, while the Rogue came within 1,600 units of the Toyota RAV4. Several of Nissan’s products benefited from strong consumer activity around the industry last month. The higher priced Murano crossover -- redesigned for this model year -- posted a 74 percent improvement. The volume-leading Altima sedan also helped with a 13 percent year-over-year increase. But Nissan is clearly reaping the reward of a multistep strategy to position the Rogue to challenge the CR-V and RAV4. Nissan’s strategy was to move Rogue factory production to the United States from Japan starting in the 2014 model year, while also fueling U.S. sales with less-expensive Rogue models built in South Korea. Nissan is also supplementing U.S. dealer inventories with Rogues built in Japan. Before unfurling the current strategy, June sales for the Rogue were 10,999 in 2012 and 15,513 in 2013. 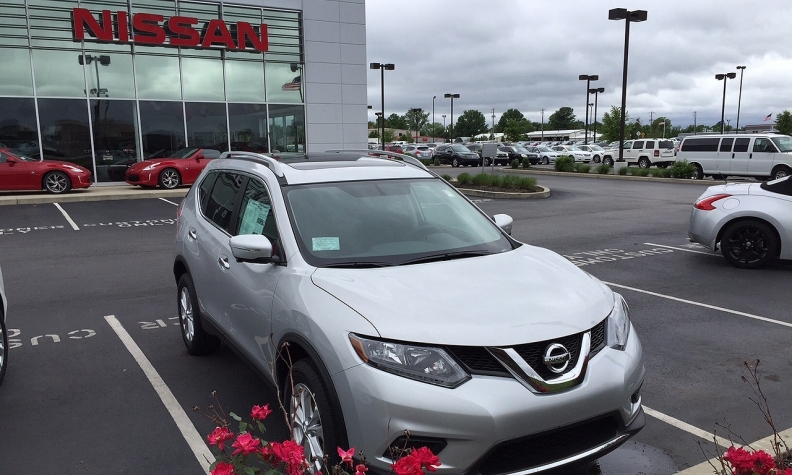 “While several automakers are benefiting from the ongoing popularity of SUVs, Nissan’s success with the Murano and Rogue puts it among the fastest growing brands in the United States,” Karl Brauer, senior analyst for Kelley Blue Book, commented in an email. At the Infiniti premium brand, sales rose 17 percent for the month, to 9,985. Most of Infiniti’s products moved ahead in June, led by a 43 percent gain in the Q50 sedan and a 39 percent increase in sales of the QX60 crossover. Combined Nissan and Infiniti results gave the Nissan group 124,228 sales in June, up 13 percent from June 2014 and a record for the month.